What do you do when life hands you lemons? I cut them up and put them in a vase. 🙂 Along with some sunflowers. You are pretty much guaranteed to smile! 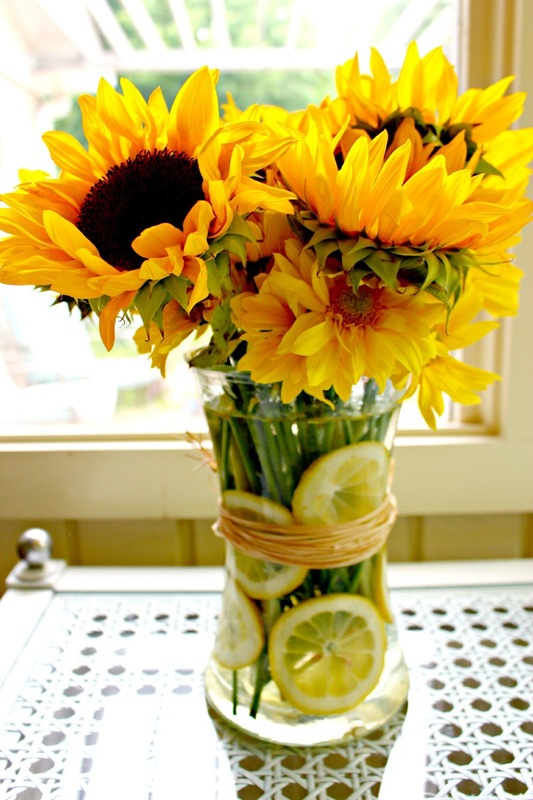 This cheerful sunflower arrangement is certain to brighten a room. I love this simple way to take a boring grocery store bouquet and turn it into something personal and unique! For this cheerful sunflower arrangement, I just sliced up some lemons and plopped a sunflower bouquet in it. The twine wrapped around the vase adds a nice extra element. I love this on our kitchen counter for spring and summer. Wouldn’t this also be so precious at a wedding shower or baby shower? And I love that everything for this sunflower arrangement can be picked up at the grocery store, and no fancy vase is needed. 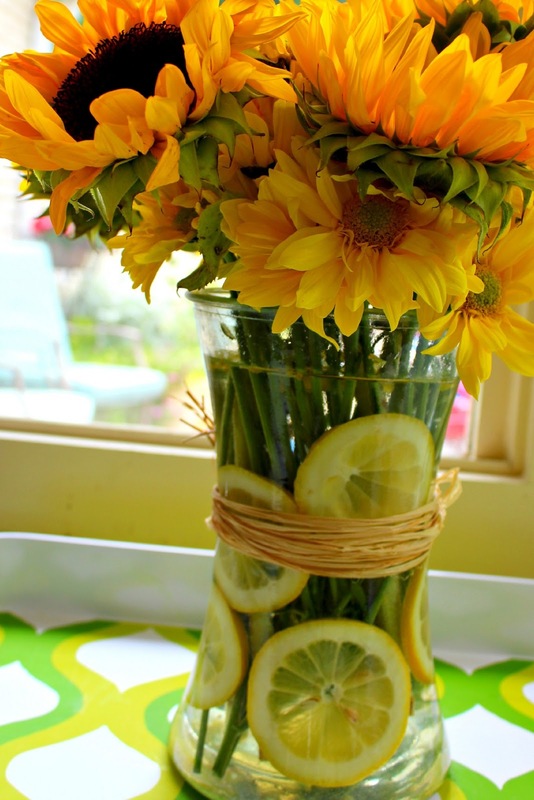 If you are a fan of using lemons in vases, you will also love this other citrus flower arrangement. Here you can see magnolia leaves and hydrangeas along with lemons and limes lined up on the kitchen island as a centerpiece. How do you add cheer to your rooms? Hi! I'm your next-door-neighbor on Susan's TT this week! Those are HUGE sunflower heads!!! They look so healthy!!! That's the beauty of those early in the year, I suppose. I live in Missouri, but Kansas is just about 20 minutes away and it, of course, is the sunflower state. I have seen some massive sunflowers in my day, but they don't always look this healthy! I like your sunflower and lemon combination. It DOES make one smile! 🙂 Have a wonderful weekend! Thanks so much for stopping by! These came from Trader Joes and are still looking great after a week! Being a southern girl myself, I love the quote on your page!! Your sunflower and lemon arrangement is very special and definitely made me smile!! Hey there fellow southerner! Glad you got a smile! Thanks for stopping in! Love your lemon name! Thanks for stopping by! Thanks for the note! It would be so perfect for a summer dinner! How long before you have to discard? Do the lemons help? The flowers are in a separate vase inside so the lemons do not impact the flowers at all.